The period covered by Arts:Search is 1895-1897. Available soon. Issued in 4 parts: Spring (Volume 1, 1895), Autumn (Volume 2, 1895), Summer (Volume 3, 1896), Winter (Vol. 4, 1896-97). Edited by Patrick Geddes and William Sharp [pseudonym of Fiona MacLeod]. Geddes used The Evergreen to promote his vision of a Celtic Revival amongst Scottish artists and writers. Literary contributors to The Evergreen included Hugo Laubach, Gabriel Setoun, Dorothy Herbertson, Fiona MacLeod, Alexander Carmichael, John Geddie, Margaret Armour, Rosa Mulholland, Noël Paton, George Douglas, William Macdonald, George Eyre-Todd, Nimmo Christie and Paul Desjardins. 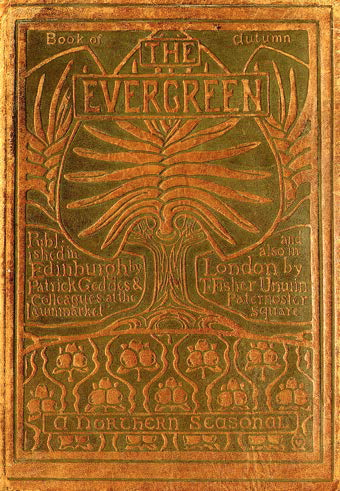 Artists whose work is illustrated or decorated the pages of The Evergreen included Charles H. Mackie, John Duncan, Helen Hay, Alice Gray, Robert Burns, Paul Serusier, James Cadenhead, Pittendrigh MacGillivray, E.A. Hornel, W.G. Burn Mursdoch, Marion A. Mason, Nellie Baxter, Annie Mackie, Effie Ramsay and Andrew K. Womrath.